Los Angeles County Metropolitan Transportation Authority (LA Metro) on Wednesday signed a 647 million-U.S.-dollar contract to purchase 282 rail cars from a Chinese company. 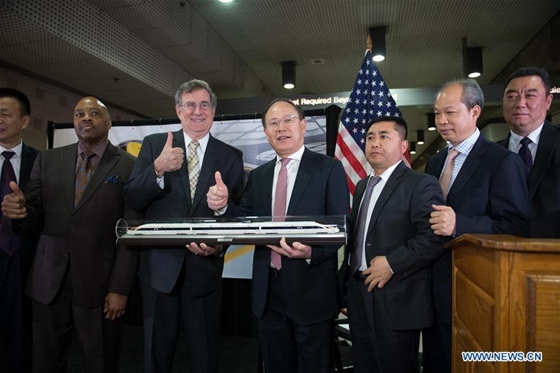 Under the contract, LA Metro will firstly pay 178 million dollars for 64 rail cars built by China Railway Rolling Stock Corporation (CRRC) to upgrade the U.S. county's subway system. Of the first batch of HR 4000 rail cars to be delivered by September 2021, 30 will replace the 25-year-old Red and Purple Line trains and 34 will serve the Purple Line Extension that is expected to open in 2023. "We anticipate there will be 50,000 weekday boardings once all seven new stations are built, and there will be nearly 80,000 new daily trips on this entire Metro rail system as a result of the opening of the Purple Line Extension," LA Metro CEO Phillip A. Washington said at a signing ceremony. "We are going to need these trains to meet our future ridership demand," he added. A new facility will also be purchased in the LA region to manufacture major components for propulsion, heating, ventilation, air conditioning and lighting systems. Therefore, the contract will create about 50 jobs generating up to 38 million dollars in local wages and benefits. About 10 percent of all the new jobs will be created for disadvantaged workers and workers from lower social economic communities. "We work with the local companies, local government and local educational institutions to create a win-win situation," CRRC President Xi Guohua told Xinhua. "We will create job opportunities, increase tax revenue and stimulate the local economy through our partnership and collaborations," he said. As required by LA Metro, the new trains will run up to 120 kph and can be in service for 40 years. Compared with the existing trains, the new cars also come with improvements for passengers' experience, including active line maps, LED displays and special designs between the train sets which will allow people to move more freely from one car to another. Washington said LA Metro, which transports about 1.3 million passengers per day, is making the county an "infrastructure capital of the world." "CRRC is now a partner in that endeavor," he said. Los Angeles County Metropolitan Transportation Authority signed a contract to purchase 282 rail cars from a Chinese company.